While sleeping under a tree, a foolish rabbit is startled by a falling apple. He runs away screaming because he believes the earth is breaking up. Along the way, his creams pick up more animals, rabbits, bears, and elephants, who all believe his shouts. They all keep running until they meet a lion who is not so easily fooled. He drags the foolish rabbit back to the tree and shows him the apple. 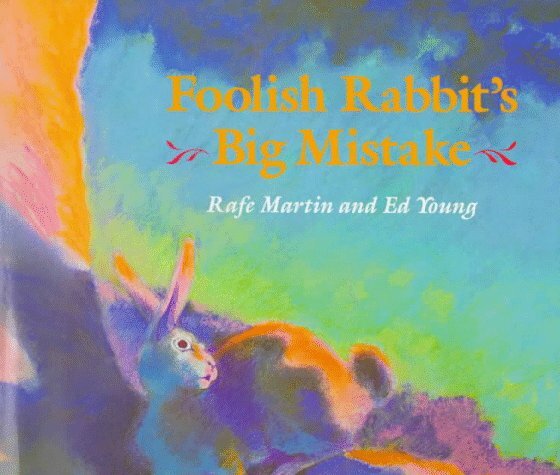 Foolish rabbit is so embarrassed that he apologizes and is eventually forgiven.This is an unusual version of the traditional story of Chicken Little. It shows the problem with jumping to conclusions in a way can be understood by children. Colorful pictures of animals streaking through the forest and a fast paced story make it seem like the story is rushing towards its end. Children will enjoy the fast pace, beautiful colors, and unique telling of a familiar story, but from a different culture. Like Henny Penny, Rabbit mistakenly thinks the Earth is breaking up which gets all the other animals worked up. Brave Lion investigates the situation and figures out that a fallen apple was the cause of Rabbit's concerns. His advice for the other animals is that they should think for themselves instead of blindly believing what they are told.The painted illustrations are superb, especially those including the brave lion and the final spread, which is frame-worthy in my humble opinion.An author's note precedes the story and helps readers understand the origins of the story and the research the author did to prepare this version. This Jataka tale is about rabbit causing a panic among the animals. He insists that "the earth is breaking up!" Wise old lion straightens everything out in the end and reminds the animals "next time something scares you...stop and see what it is," he asserts, "you may find out that there's nothing really to be afraid of at all." Yes, that is good advice for us all. It even (sometimes) works on children's bedtime fears. This book was published in 1985. It is one of my favorite picture books. The illustrations are amazing and the repetitive text, "The earth is breaking up!" grabs kids attention and keeps it. This is a great fable that, in the end, teaches a valuable lesson on clarifying information. A worthwhile read! This story is silly and yet a little anxiety-provoking, and the build-up just gets more and more dramatic until the conclusion. It is an instructional tale with bright, colorful, and active pictures. My chief complaint: eleven different animals and they are all male. Really?? Shame! Similar to Chicken Little or Why Mosquitoes Buzz in People's Ears. More appropriate for at least 4 year olds. my 3 year old seemed to get bored right away but the pictures were nice. I see how this book is related to the boy who cried wolf. Don't in my to conclusions. Rafe Martin - This professional storyteller lives in Rochester, New York.